Sometimes, there are ugly bugs in tools, and without knowing about them, it is likely to spend hours and hours, and of course to be frustrated. Knowing about these issues does not remove the issue, but at least helps to cut time to deal with it. And here is one which was nagging on me for a while with the GNU GDB debugger in Eclipse…..
💡 I have used the Q4 2014 GNU ARM Embedded (launchpad) toolsuite/gdb (4.9-2014-q4-major), and I have found that with that gdb version the issue described is fixed. If you are using Kinetis Design Studio, see “Switching ARM GNU Tool Chain and Libraries in Kinetis Design Studio” how to upgrade the tool chain. After digging and doing some trial and errors, I have found what is causing this. Target has been RESET and is active. internal-error: decode_line_full: Assertion `state->canonical_names[i].suffix != NULL' failed. I’m thinking this is a generic GDB client problem, and not a problem of the P&E Multilink or Segger J-Link GDB server. 734,124 &"set mem inaccessible-by-default off\n"
734,125 &".gdbinit: No such file or directory.\n"
734,125 10^error,msg=".gdbinit: No such file or directory." 734,648 14^error,msg="Can not fetch data now." 734,658 @"Target interface speed set to 1000 kHz\r\n"
734,681 @"R0 = 00000000, R1 = 20000F18, R2 = 20000168, R3 = 12345678\n"
734,681 @"R4 = 4761032D, R5 = 40020000, R6 = 0000FFFF, R7 = 00000000\n"
734,681 @"R8 = AFBF9D3F, R9 = EFBBFFFB, R10= DFBEFEFD, R11= 00002000\n"
734,681 @"R12= FF7FEBFD, R13= 20003000, MSP= 20003000, PSP= FF7FBFFC\n"
734,681 @"R14(LR) = 20000121, R15(PC) = 00000BDC\n"
734,681 @"XPSR 61000000, APSR 60000000, EPSR 01000000, IPSR 00000000\n"
734,681 @"CFBP 00000000, CONTROL 00, FAULTMASK 00, BASEPRI 00, PRIMASK 00\r\n"
734,682 @"Select auto target interface speed (2000 kHz)\r\n"
734,723 &"monitor flash breakpoints 1\n"
734,723 @"Semi-hosting enabled (VectorAddr = 0x08)\r\n"
734,723 &"monitor semihosting IOClient 1\n"
734,723 @"Semihosting I/O set to TELNET Client\r\n"
734,731 ~"Loading section .interrupts, size 0xc0 lma 0x0\n"
734,732 ~"Loading section .cfmprotect, size 0x10 lma 0x400\n"
734,732 ~"Loading section .text, size 0x1f38 lma 0x410\n"
734,733 ~"Loading section .init_array, size 0x4 lma 0x2348\n"
734,733 ~"Loading section .fini_array, size 0x4 lma 0x234c\n"
734,733 ~"Loading section .romp, size 0x18 lma 0x2350\n"
734,734 ~"Start address 0xbdc, load size 8232\n"
734,734 ~"Transfer rate: 2679 KB/sec, 1372 bytes/write.\n"
734,745 23-data-evaluate-expression --thread-group i1 "sizeof (void*)"
734,765 25-interpreter-exec --thread-group i1 console "show endian"
734,775 ~"The target endianness is set automatically (currently little endian)\n"
Loading library C:\Freescale\KDS_1.1.1\eclipse\plugins\com.pemicro.debug.gdbjtag.pne_1.1.4.201409071615\win32\gdi\unit_ngs_arm_internal.dll ... Done. 'Kinetis' is a registered trademark of Freescale. Copyright 2012 P&E Microcomputer Systems,Inc. Target connection timeout:     5 sec. I thought that disabling that breakpoint might be the cure. However, it is necessary to remove/delete that breakpoint. The same thing can happen if using an expression (see “Variable Debugging with Eclipse Kepler“) to ‘not-existing-anymore’ locations. Here again: the solution is to remove the expressions if this happens. With this, I get rid of that message :-). detected,\nfurther debugging may prove unreliable.\nQuit this debugging session? " 443,226 ~"(y or n) [answered Y; input not from terminal]\n"
detected,\nfurther debugging may prove unreliable.\nCreate a core file of GDB? " /home/build/work/GCC-4-8-build/src/gdb/gdb/linespec.c:2445: internal-error: decode_line_full: Assertion `state->canonical_names[i].suffix != NULL' failed. If there are breakpoint installation problems reported, remove the breakpoint from the Breakpoints view and delete the message from the Problems view. If you are using the GDB debugger (e.g. with the GNU ARM Eclipse plugins and/or Kinetis Design Studio), and if you cannot debug, then give it a try to delete your breakpoints and expressions. At least until this GDB bug gets fixed (I have submitted a bug report). This entry was posted in Debugging, Eclipse, Embedded, Tips & Tricks and tagged arm gcc, Debugging, Eclipse, gnu gcc, Tips&Tricks by Erich Styger. Bookmark the permalink. Yes, that usually works better as Eclipse (Kepler+CDT) knows the current debug configuration. There is a painful problem in CDT for selecting the debug/launch configuration with the menu or the ‘debug’ icon: if not using the drop down list, I see that sometimes it uses the wrong configuration which creates frustration. Overall I am simply unimpressed with KDS (Ver 1.1.1) and its debugging (PE’s Multilink) with a K60 design. I have been battling for several hours with KDS debugging issues and it quite frustrating… probably as frustrating as your experience with your GDB bug. sorry for my late response, but: I get that same message if I try to debug again if there is already a debug session going on. Can you check that there is no debug session already running? 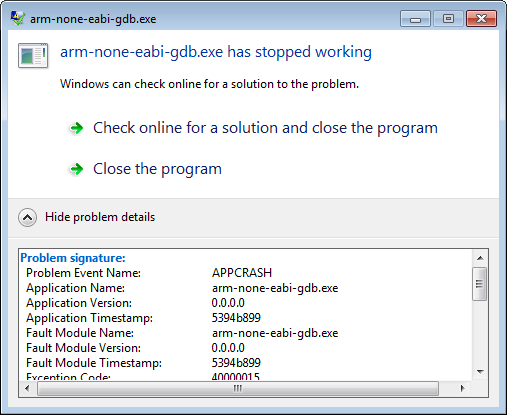 Or that you have a zombie gdb running in the task list (Windows task manager)? You are an angel!!!!! Thanks Erich.